Jam Sebastian was suppose to have his scheduled chemotherapy but after 10 days he was still unable to do so and asked his family to stop the treatment. Battling lung cancer, Paolinne Michelle Liggayu of Jamich, the YouTube couple sensation, shared moments with Jam through Instagram and Facebook but admitted that he was not up for it the past few days. 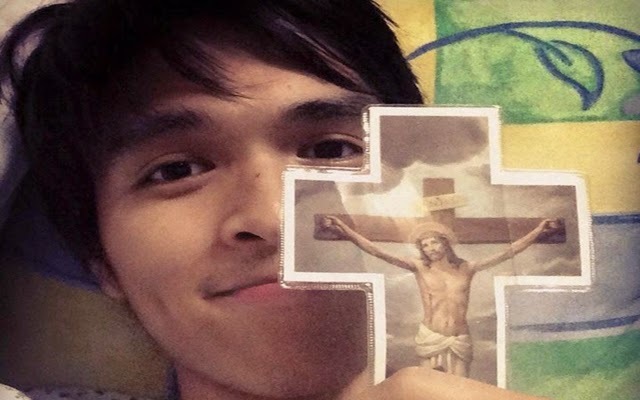 On January 31, 2015, Yexel Sebastian, Jam’s older brother, had shared a text from Jam asking them to consider ‘mercy killing’ as he is now having a hard time. His mother, Maricar Sebastian, shared that she was moved to tears after reading Jam’s message. She said that she had given everything her youngest son had wished for but his recent request is one thing she can’t afford to do. She expressed her determination to continue fighting his disease. The family had been staying in the hospital for already 10 days waiting for the next chemo but Jam needed to get strong first. His mother also shared that Jam won’t even let anybody take his vital signs and blood pressure. He also refused dextrose. Mich, had proposed to Jam on 2014 in a prayer meeting which greatly surprised ill stricken Jam. The fans had been hoping for the marriage since but his mother said that it will be difficult. Jam wanted a proper wedding when he is strong and well enough, but as of the moment he can’t even stand. Mich had posted their photo on January 30, saying that it had take some time before she was able to post a photo again since he was not in his usual mood in the past. They are waiting for him to get stronger for him to continue his therapy. The couple had revealed that Jam had been diagnosed with Stage IV Cancer last March 2014.